Visualizing Impact is powered by people and their vision for change. We are working to build a community that shares our interest in the use of data, technology, and design for social justice communication. We are currently hiring for the following roles. Don’t see yourself here? Connect with us anyway by JOINING OUR NETWORK. Even if we’re not hiring at the moment, we’d love to hear how your skills fit into our work. When we need volunteers, consultants, or new team members, we’ll turn to our existing network for leads first. Click on one of the groups below to learn more. Our multidisciplinary core team collaborates remotely from cities such as Beirut, Amman, Ramallah, Dubai, and Toronto. Scroll for more brilliant people in our team! Jessica has a background in human rights and international development and a strong interest in social entrepreneurship. Over the years, she has been involved in numerous VI projects, especially helping to launch VI's focus on digital rights. Prior to joining VI, she was involved in refugee rights advocacy in the US, the UK, and the MENA region. She holds an M.Sc. in Refugee and Forced Migration Studies from the University of Oxford and a Bachelor’s degree in international studies from the University of Kentucky. (Profile updated 2017). Scroll for more brilliant interns in our team! Our network is an extended family of people who inspire us and who have a strong interest in applying their skills to social justice issues. This list includes those we have worked with in the last year. Scroll for more brilliant people in our network! Fadi is an urbanist, interdisciplinary design strategist and management professional. He shares ten years of collaborative experience in planning and architecture, process design and infographics, and critical research and social advocacy. He is editor of the book At the Edge of the City (2010) and recipient of the Basil Fuleihan Innovative Good Governance Award (2008). Fadi holds graduate degrees from Parsons The New School for Design and the American University of Beirut. (Profile Updated 2016). Kelsey Gallagher is a recent graduate of the Honors Specialization Political Science program at Western University, with special interests in critical Canadian security studies and emerging conflict zones. His previous research mandates focused on civil-military relations in the Philippines and the politics of Spanish-American merchant vessels in the 18th century. He is an editor and contributor to The Caspian Report, and enjoys exploring alternative political organization and the geopolitics of the Middle East. (Profile updated 2016). Matthew Stender is a Berlin-based tech ethicist & futurist who focuses on the implications of emerging tech & what it means to be human in the 21st century. (Profile updated 2017). Shima Shafieian is a Toronto-based designer and stylist. She is a recent graduate from the Fashion Design program at Ryerson University. Thoraya is a strategic planning and management consultant with eight years of professional experience in both the private sector and the UN. She holds a Masters’ Degree in Social Policy and Planning from the London School of Economics. (Profile updated 2016). Zeina Jaber is a recent graduate of art and design living in San Fransisco. (Profile updated 2016). Partnerships are an extension of our core team. Each of our partners adds value unique to their area of specialization. [Click here] to view Visualizing Palestine partners. Scroll for more brilliant partners! Ahmad is a full-stack software engineer who loves to work on projects with social impact. Although his recent work focuses on bootstrapping start-ups from A to Z, he has also worked extensively with large public and private sector organizations on coding mission critical applications. Notable clients include Deutsche Bank, Cigna and governmental organizations in the US and Canada. We engage in collaborations with organisations and entities whose overall focus or ‎current project aligns closely with our mission. [Click here] to view Visualizing Palestine collaborators. The Electronic Frontier Foundation is the leading nonprofit organization defending civil liberties in the digital world. Founded in 1990, EFF champions user privacy, free expression, and innovation through impact litigation, policy analysis, grassroots activism, and technology development. They work to ensure that rights and freedoms are enhanced and protected as our use of technology grows. Visualizing Impact and EFF are co-founders and co-hosts of the awardwinning Onlinecensorship.org project, which focuses on censorship enacted by social media companies. Global Voices is a border-less, largely volunteer community of more than 1400 writers, analysts, online media experts, and translators. Global Voices has been leading the conversation on citizen media reporting since 2005. They curate, verify and translate trending news and stories you might be missing on the Internet, from blogs, independent press and social media in 167 countries. Visualizing Impact is a collaborator on Global Voices Advocacy's Threatened Voices project, which tracks threats facing online content creators around the world. Small Media is a London-based action lab, providing digital research, training and advocacy solutions to support the work of civil society actors that provides assistance to at-risk communities globally. Visualizing Impact and Small Media collaborated in organizing Data4Chan.ge Beirut 2015, and have also connected on work themed around freedom of expression. Mada Masr is an Egypt-based media organization interested in producing intelligent and engaging journalism, and more generally in re-examining the role of media in relation to its public. Visualizing Impact and Mada Masr collaborated on "Visualizing Egypt" between 2014 and 2016, exploring censorship in Egyptian media. Silatech is a regional social organization that works to enable jobs and expand economic opportunities for young Arabs. The organization promotes large-scale job creation, entrepreneurship, access to capital and markets, and the participation and engagement of young people in economic and social development. Visualizing Impact and Silatech collaborated in 2013 to work on the theme of Arab youth employment. The Lutfia Rabbani Foundation is dedicated to building sustainable, inclusive societies in Europe and the Arab World by facilitating Euro-Arab dialogue and educational exchange. IFEX is the Global Network Defending and Protecting Freedom of Expression. In 2016, Visualizing Impact joined the network of organizations fighting for Freedom of Expression as an IFEX Member. Meet our advisors, whose time, talent, and expertise empower our mission. Also, check out our past advisors. VI is extremely grateful for the contributions of past members of its board of advisors. Members made an important contribution to the strategy, development, and sustainability of VP's mission. Also, check out our current advisors. Over the past 25 years, Zina has been involved in philanthropy and campaigning for human rights, with special interest in health, medical education, culture and most recently the Palestinian Museum. She is now a member of the Board of Trustees of the Welfare Association (Taawon). Zina has pursued a career in the pharmaceutical industry in Jordan and currently serves on boards of family pharmaceutical businesses. She is also a member of the Board of Directors of InvestBank, Jordan. (Profile updated 2016). Kavita Ramdas is a mindful leader, an advocate for gender justice and respected thought commentator on critical global and domestic challenges. She is passionate about advancing equitable development, inclusive growth, social entrepreneurship, gender and racial equity, and social change philanthropy. She has recently served as Senior Advisor to the President of the Ford Foundation on Global Strategy and Ford Foundation Representative for India, Nepal and Sri Lanka in New Dehli. From 2010 to 2012, Kavita was based at Stanford University, as a Visiting Scholar jointly with the Center on Philanthropy & Civil Society and the Center on Democracy, Development and the Rule of Law. She was the founding Executive Director of Stanford's Program on Social Entrepreneurship and ensured its long term viability. From 1996 to 2010 Kavita served as President and CEO of the Global Fund for Women. Under her leadership the Fund exponentially grew in assets becoming the world’s largest public foundation for women’s rights. (Profile updated 2017). Sultan Sooud Al-Qassemi is a commentator on Arab affairs. Sultan Al-Qassemi is widely recognized for his use of Twitter and has been described by numerous media outlets as a prominent voice during the events of the ongoing Arab Spring. In February 2014 Sultan Al Qassemi joined the Global Commission on Internet Governance and in the summer of 2014 became an MIT Media Lab Director's Fellow. Sultan is the founder of the Sharjah based Barjeel Art Foundation whose mission is to promote art by artists from the Arab world through a series of exhibitions locally and internationally. He is also a prolific writer whose articles have appeared in various publications including Foreign Policy, The Guardian, The Independent and CNN. (Profile updated 2015). Khaled Al Sabawi is a Canadian-Palestinian engineer and the founder and President of MENA Geothermal and the TABO Initiative. In 2010, Global Post named him "One of the World's Top Energy Entrepreneurs" for his work at MENA Geothermal. In late 2010, Khaled became the General Manager of UCI, MENA’s parent company and one of the largest real-estate development companies in Palestine. At UCI, Khaled founded the TABO initiative, the first project dedicated to creating title deeds and expanding property rights in Palestine. Khaled has lectured at McGill University in Canada and Harvard University and MIT in the United States. In November 2014, the University of Waterloo Faculty of Engineering awarded him the Young Alumni Achievement Medal. (Profile updated 2015). Fateh Azzam is recently retired from his role as Director of the Asfari Institute for Civil Society and Citizenship and Senior Policy Fellow at the Issam Fares Institute for Public Policy and International Relations, both at the American University in Beirut. He previously served as the Middle East Regional Representative of the UN High Commissioner for Human Rights, Director of Forced Migration and Refugee Studies at the American University in Cairo, Human Rights Program Officer at the Ford Foundation in Lagos and Cairo, and Director of the Palestinian organization Al-Haq. He led the process of establishing the Arab Human Rights Fund. Azzam holds an LLM in International Human Rights Law from the University of Essex. (Profile updated 2017). Maysara Abdul Majid is a Structural Engineer who has been in the Construction Industry in Qatar for the past 10 years. He is the Deputy Managing Director at Arcon, a construction company focused on government projects in the State of Qatar. Maysara is also Co-founder and Managing Partner at Seven Dimensions, a construction technology company providing solutions towards lean construction methods through the use of building information modelling (BIM). Maysara also sits on the board of the Columbia University Alumni Club in Qatar. Amr Ben Halim is a founder, board member and shareholder of AYTB and Maritime Industrial Services Arabia (MISA), leading providers of hydrocarbon processing, energy, and industrial services in the Kingdom of Saudi Arabia and Qatar. Amr founded one of the first women-led micro-lending programs in the Palestinian refugee camps of south Lebanon. He is also a founding board member of the Forum for Democratic Libya, an NGO working to promote transparency, civic engagement, and a culture of democracy in Libya. He is a member of the board of trustees of the Arab Fund for Arts and Culture (AFAC) and is an active member in and supporter of various philanthropic and civil society projects in the Arab world. (Profile updated 2016). Ahmad F. Zuaiter is the Founder and Managing Partner of Jadara Capital Partners (JCP), a Frontier Market specialist fund management firm based in the Dubai International Finance Center. Prior to founding JCP, Ahmad served as a portfolio manager at Soros Fund Management (SFM) in New York and Istanbul, Morgan Stanley Investment Management (MSIM) Emerging Markets Group, Scudder Kemper Investments, EFG-Hermes, SHUAA Capital, and Merrill Lynch & Co. in New York. Ahmad earned his undergraduate degree from Georgetown University in 1990 and was awarded a Masters in Business Administration from the Harvard Business School in 1996. (Profile updated 2014). Amr AlMadani co-founded National TalentS Company for Training and Education (TalentS) in 2007, a local knowledge-based start-up company with ‎a mission to inspire Saudi Arabian youth in the fields of science, ‎technology, engineering and math (STEM). TalentS has grown to become a leading regional ‎organization in the field of STEM youth empowerment and an international entrepreneurship award-winner. In 2010, TalentS created the Mishkat Interactive Center for Atomic and Renewable Energy, an interactive learning space dedicated to promoting ‎innovation in the field of sustainable energy and facilitating effective learning ‎experiences for over 400 students daily. To advance his objective of creating a scalable, high-impact, low-cost and localized mobile-based program to promote student engagement with STEM, Amr focused his fellowship on examining innovative education methods, science communication and science centers, renewable energy and efficiency technologies, and youth leadership programs. (Profile Updated 2016). Ms. Rabbani has over 20 years of experience working with various local, regional and international organizations on human rights, women’s rights and development issues in the Middle East/North Africa (MENA) region. Hanan Abdel Rahman-Rabbani is the Regional Program Manager for MENA and Asia at the International Development Law Organization (IDLO). Prior to this position she served as the Open Society Foundations’ Senior Program Officer on women’s rights and Gender Development in the Arab region. A graduate of the United World College, Lester B. Pearson College of the Pacific in Victoria, Canada, she studied at Birzeit University in the West Bank, Durham University in England and earned a Master's Degree in Development Studies from the Institute of Social Studies (ISS) in The Hague, Netherlands. From 2005 to 2009, Ms. Rabbani worked as a human rights officer with the UN Assistance Mission for Iraq (UNAMI) and managed the Human rights office in Amman. In Palestine, among other organizations, Ms. Rabbani worked for Al Haq, Women’s Centre for Legal Aid and Counseling (WCLAC), Associates in Rural Development (ARD), and the Canadian International Development Agency (CIDA). In Jordan, she worked as the Iraq Advisor for The Friedrich Naumann Foundation’s Arab Regional Office. She also worked as a consultant for Amnesty International, International Crisis Group, and Sisterhood is a Global Institute (SIGI). (Profile updated 2016). Sari Kassis is a trade unionist at large and a sustainable development consultant with Q perspective, a regional consulting firm that works with organisations and companies to assist them in building operational and organisational structures and systems that help position them to deal with the challenges of our region and the world today. He is a firm believer in South to South cooperation and tries to function as a node between worthwhile organisations, movements and people. A social entrepreneur and strategy advisor, Gilbert Doumit has dedicated his work to meaningful change in the MENA region through policy reform, institutional strengthening, and leadership development for more than two decades. In 2010, he founded Beyond Reform & Development (BRDI) Group, a social business and consulting firm based in Beirut, where he continues to serve as Managing Partner. BRDI’s mission is to find solutions for governments and civil society to establish innovative, inclusive, and participatory policies and institutions in the MENA region. Gilbert is also a Senior Partner and Founder of BRDI’s sister company, Beyond Consulting & Training (BCT). Concentrating its efforts in the private sector, BCT is a leading management and training firm that specializes in leadership and organizational development for multinational companies across the Gulf and Levant. At BCT, Gilbert has advised clients in industries such as banking, retail, manufacturing, and academia. Noha is keen on contributing to the economic development of her surroundings by sharing her experience and knowledge with up-and-coming enterprises. She has over 13 years of experience in the accounting, finance, and management consulting fields, having been recognized for her achievements and performance. After acquiring much of her experience with Ernst & Young, she shifted gears to make that experience available to local start-ups. She continues to provide support through consultations as well as heading workshops for local businesses in the community. She is passionate about applying excellence in her work and is driven by making a difference through her professional contribution. We would like to acknowledge and thank our supporters for their role in making this work possible. Thank you. [Click here] to view Visualizing Palestine supporters. We have developed the following resources to support others working in our field. Interested in creating infographics? 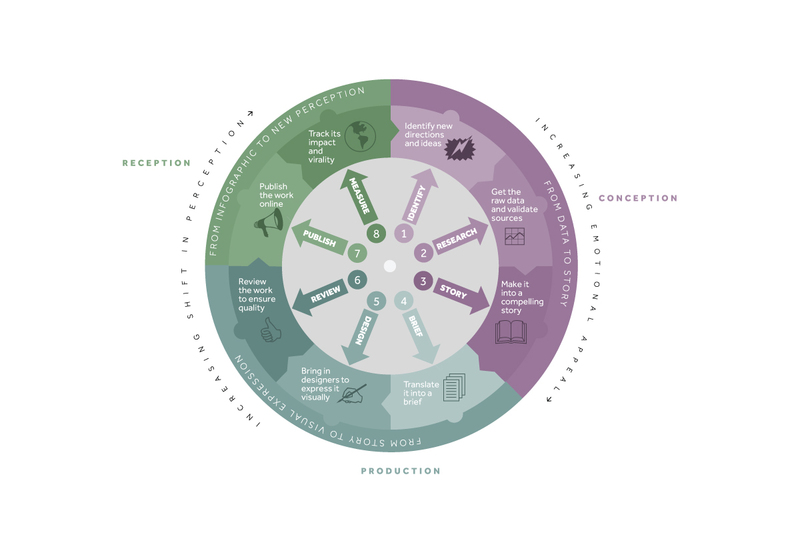 Our process wheel gives you an overview of the steps in our creative process. Our detailed process offers closer look at who and what goes into our production process. Best used in print. Anyone can learn to tell powerful stories that stick. See our storytelling process for tips. In 2013, we ran a crowdfunding campaign in Lebanon to support our work. This guide is a reflection on our experience and learnings. Check out our adaptation of the RAW data tool by Density Design. Hamra, Beirut, 226 Makdissi Street. In addition to our main offices, team members work from multiple locations including Dubai, Amman, Ramallah, and San Francisco.